Here at Roof Windows 4 You, we stock FAKRO top-hung roof windows designed with an innovative preSelect system that allows them to operate with additional centre pivot practicality. These units are simple in design but revolutionary in their application. At the touch of a switch, these preSelect roof windows can alter the way they're operated, matching the design of a functional top hung rooflight with all the benefits of our centre pivot roof windows. This means you can have both the increased opening space and unlimited view of a top hung model at the same time as the 180-degree rotating sash of a centre pivot for easy cleaning or use with an awning. They also benefit from FAKRO's signature build quality, with fantastic craftsmanship meeting high-grade timber and glazing. Plus, they're available in a choice of finishes, including natural pine, white acrylic, white PU-coated pine, and white PVC. Our top-hung preSelect rooflights are also packed with many of the innovative features found in our other windows. These include a V40P air-inlet to reduce heat loss and a unique moisture drainage system to keep your unit in full working order. They're also designed to seamlessly blend into the look of your loft conversion or home extension. You'll be glad to know these units are fully compatible with many of our roof window accessories and blinds, allowing you to get maximum functionality out of your units. Got any questions about our FAKRO preSelect windows? Get in touch with us and we will be happy to answer your query. Shop for yours today. When the preSelect roof window is in its top hung mode, the view is not restricted. 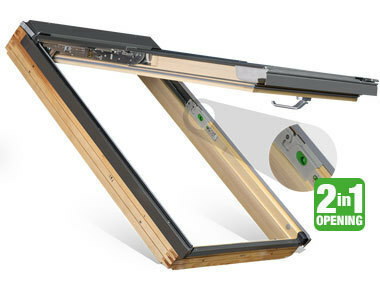 With its 180 degree rotation this enables easy cleaning on the outer pane but does not compromise safety or security.